It’s so hard to give something special and original every time for Christmas, birthdays and anniversaries but it’s easy to give unique, personalised gifts when you use a Plasti-Kote spray finish. Plasti-Kote gives you a professional paint finish without mess or fuss and with a minimum of time and effort. Plasti-Kote has a huge range that include Crackle, Fleckstone, Coloured Enamels, leafing and non-leafing metallics and Glass Paints. There are 5 different paints to transform boring glass or plastic into something unique and unusual with different colours, effects and patterns. So you can turn plain glass into a dazzling, original ornament in just minutes! The Crackle paints allow you to get that great look of aged furniture yourself using a two-part system. It’s up to you how cracked your creation appears, whether you want large, medium or eggshell and it’s all in how you apply the two paints making it a very simple process! Then there is Plasti-Kote Fleckstone, a textured paint that gives the look and feel of stone. Like Crackle, Fleckstone comes in many different colours and can be applied to virtually any surface, even polystyrene. The Plasti-Kote Super Enamel and Super Satin ranges, deliver the ultimate in colour choice, from high gloss fashion to classic semi-gloss colours and the Odds ‘n’ ends paint comes in handy bottles or sprays which is fast drying, making it ideal for small jobs or craft projects. Plasti-Kote’s huge range also includes Metallic paints that actually contain real metal pigments, making them very realistic. They’re high gloss and high leafing paints that will give a deep chrome or rich gold finish! You can identify each Plasti-Kote can by the lid, which are secure so they’re safe around kids. They are free of the usual nasties including toluene so there will be no worries using it on kid’s furniture or toys. 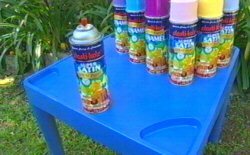 Plasti-Kote also make a Can Gun, which means no more messy, sticky or tired fingers. The Can Gun snaps onto virtually any spray can from paint to insecticides to cleaning products. Plasti-Kote’s quality means that you get as much as three times the coverage of some budget priced product and a smooth durable finish that will last for years. There are many items around your house that could be revitalised with a Plasti-Kote product and whether you want to give them as gifts afterwards is up to you. To find more about Plasti Kote products log onto the website or ask your favourite quality retailer.